It’s Mother’s Day here in the United Kingdom today and, as every year, it’s a day of mixed emotions for me and many others who have lost their mothers. Mine passed in 1991 at the age of 43 from cancer. I was pregnant with my eldest daughter at the time. 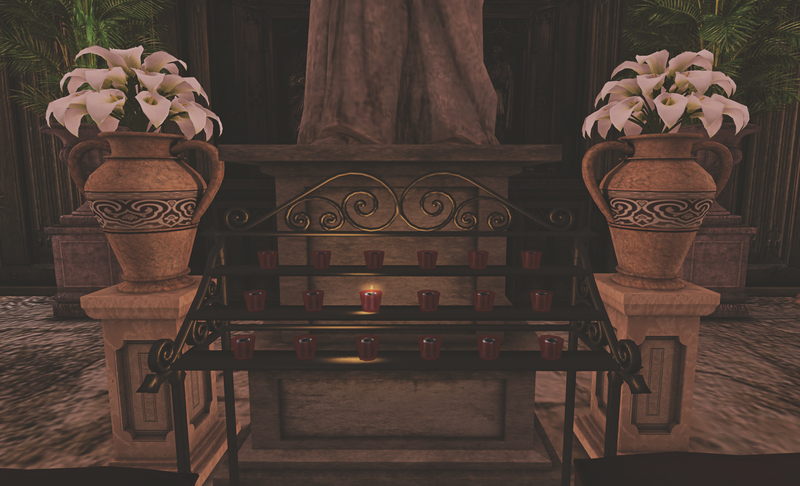 Currently my children are in the kitchen making lunch for me to celebrate today so I thought I’d spend a little time in Second Life and decided to head over to Basilique to spend some time of quiet reflection in the Basilica. The basilica is always worth a visit it’s one of the true beauties of Second Life whether you have faith or not it’s a gorgeous representation made within our virtual world. As you enter the Basilica to the right there is a small chapel with a rack of votive candles. I selected a candle to light and a drop down box appears for you to complete with a name of a loved one and that name appears over the candle for 24 hours. I’ve visited the cemetery in real life today to leave some flowers but I loved that I could do something to remember my mother in Second Life too. To all mothers, whether you celebrate today or later in the year, I wish you a happy and relaxing Mother’s Day. You can find out more about Basilique Town and the basilica on Canary Beck’s website.